Pierre-Auguste Renoir (1841–1919), Luncheon of the Boating Party, 1881. Oil on canvas, 51 ¼ x 69 1/8 inches. Acquired 1923. The Phillips Collection, Washington, D.C.
I’ve given lots of tours of Luncheon of the Boating Party, and almost every time I talk about it, someone brings up the girl in the lower left cooing at her dog. I have been known to make a pretty bad joke, saying, well how else would you know the scene is set in France without the dog at the table? Kidding aside, the pup in the painting plays an important role. Ever notice how almost all of the characters in the artwork seem to be engaged in flirtatious exchanges, except the girl with the dog? Guess what—she’s Renoir’s girlfriend and future wife, Aline Charigot. With his education, Renoir would have known that dogs in art operate as symbols of loyalty and fidelity, that’s why people often call their pets Fido. So it’s not surprising Renoir would have painted his future bride nuzzling a cute little pooch rather than romancing another character in the painting. In addition to Luncheon of the Boating Party, Renoir created a number of important works where dogs play a prominent role. Fifteen years earlier, he painted At the Inn of Mother Anthony, Marlotte (1866) featuring diners gathered around a table with a dog (a poodle? a Bichon frisé?) curled up underneath. At New York’s Metropolitan Museum of Art, check out his stylish portrait of the Charpentier family complete with their Newfoundland named Porthos. Renoir depicted Aline in the company of dogs at least two other times. In The Apple Seller (c. 1890) she sits with two young children and playful dog. Thirty years after Luncheon of the Boating Party, he painted a tender portrait of an older Aline holding her new little puppy Bob. 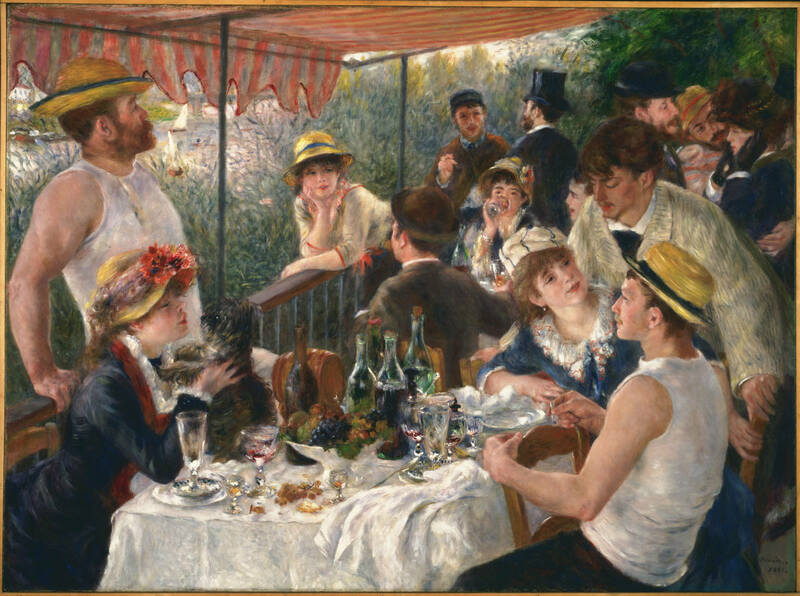 This entry was posted in Experiment Station and tagged luncheon of the boating party, permanent collection, pets, renoir. Bookmark the permalink. If you are a painter it is painfully obvious as to the role of the dog and girl. After doing drawings from Renoir’s masterpiece pictured above it becomes very clear that the placement of both the girl and dog in front of the standing male figure suggest a sexual act. This configuration of figures is no mistake, it is in fact a metaphor for the sexual energy running through the whole painting. The girl (Aline Charigot) has a frenzied rhythm in her handling of her pup which makes the underlying act very clear and very funny. So I would argue that Aline and her dog are engaged in much more then a flirtatious exchange. Thank you for sharing your point of view on the painting. This is so interesting. We used to live in DC and went to visit this painting quite a few times (it was and still is my mom’s favourite painting) but I never thought about this. Thank you for sharing. Thanks for your comment Lena. I’m glad it has you thinking about the painting in a different way! Well, yes, and then there is Madame Renoir avec Bob, 30 years later, and I do believe the sexual tension has waned. In fact she appears somewhat weary. Many thanks, Brooke, for your thoughts. Thank you Pat. By the time Renoir painted Aline with Bob she was about 50 years old and had already had their three children.